Geology Jenga | A foreseeable, yet surprising earthquake? 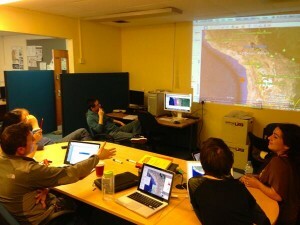 EGU Blogs » Network » Geology Jenga » A foreseeable, yet surprising earthquake? A foreseeable, yet surprising earthquake? On Wednesday morning I woke up to a flurry of activity on my twitter feed: there had been a large earthquake in northern Chile. I followed up some of the tweets and realised that there had also been some tsunami warnings as a result of the earthquake. After ascertaining that the scale of the disaster wasn’t as large as I’d anticipated, given the size of the quake (I don’t want you to think for one moment that I am belittling the plight of the people affected by the earthquake. I was more relieved that the damage was not on a larger and wider scale, for instance similar to that caused by the 2011 Tōhoku earthquake and tsunami), I envisaged that there would be frenzied activity at the seismology and geodynamics group at my university. Turns out I wasn’t wrong about the frenzied activity in the seismology office! Photo courtesy of Steve Hicks. A large amount of the research done by the Liverpool seismology group revolves around understanding the structure and properties of the central Chile subduction zone. So, I got in touch with my fellow PhD student, Steve Hicks (who has guest blogged for us before on the hazards associated with earthquakes) and asked him to write a blog post that might shed some light on the events in Chile. Steve describes the lead-up to Wednesday’s magnitude 8.2 earthquake, examines what we have learnt so far, and what it may mean for future earthquake hazard in northern Chile. Earthquakes tend to take us seismologists by complete surprise, but this did not seem to be one of those. We were not alone. The people living in northern Chile were also waiting in anticipation. Over the past few weeks, they had become accustomed to the ground beneath their feet shaking. 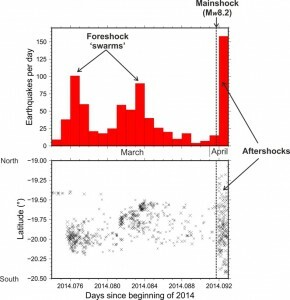 Within just one week in March, four magnitude 6 earthquakes struck northern Chile and were accompanied by over 300 smaller events. Aerial view of the rupture area showing the location of the mainshock, and aftershocks with magnitude greater than 5. The colour image shows the preliminary USGS slip model for the mainshock. An earthquake was long expected in northern Chile, too. For several decades now, it has been recognised as a seismic gap. We believed that this region was capable of producing large earthquakes, yet a large rupture had not been recorded since 1877. We could not be sure when it was going to rupture again, but the recent earthquake sequence was certainly keeping the seismological community on edge. Chile is home to some of the world’s largest earthquakes. The country is situated where the eastern part of the Pacific seafloor (the Nazca plate) is sinking beneath the South American Continent. In shallow parts of this subduction zone, the two plates can become stuck and locked against each other, leading to big accumulations of tectonic stress that may be sporadically released every several hundred years. By taking a closer look at the earthquake, we find that aspects of earthquake were in fact somewhat surprising. The earthquake was located at the edge of a region of the megathrust fault that was according to one model, highly locked. 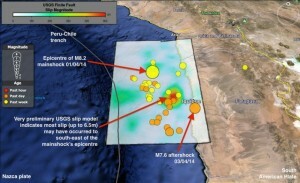 However, according to a preliminary model from the USGS, most slip was located to the southeast of the earthquake epicentre, in a region of low locking. Low locking implies that the fault is constantly sliding and less capable of producing large earthquakes. Data from on-land GPS stations are used to calculate locking, but the accuracy of these calculations tends to be poorer offshore, where much of the fault is located. The primitive nature of the rupture model means that it may also open to errors. To obtain a more robust slip model, scientists will now begin to analyse a wide range of datasets including GPS, seismic, satellite and tsunami observations – a process that will take many months. Seismicity in northern Chile before and after the earthquake. Earthquake locations taken from the Servicio Sismológico Nacional, Chile. The strong magnitude 7.6 aftershock that hit on Thursday morning reminds Chileans that earthquake hazard still remains high. 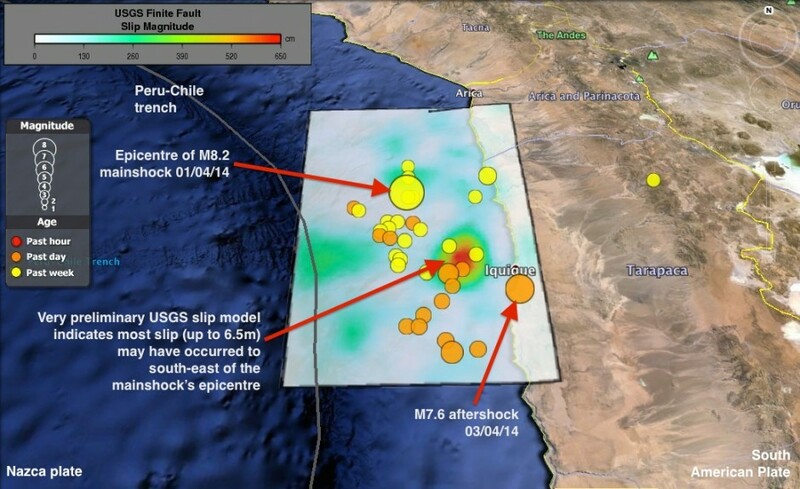 Some scientists believe that based on the earthquake’s size and location, it is possible that the northern Chile seismic gap has not yet fully closed. Attention may now be drawn further north and toward the Peruvian border where the potential for a large earthquake could remain. What is for sure though is that earthquake scientists will be working hard and listening to the fault’s crackles to understand better what it may have in store for the future.